Marketers have a wide range of channels available to them to reach prospects. These are often split between above the line and below the line marketing efforts. Depending on the size of your organisation, you will have budget to cover both. In both the B2B and B2c space, events are one way to capture the attention of prospects and look for ways to deliver value and support the buyer’s journey. 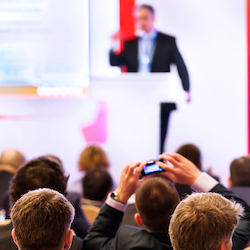 An event can be webinars, small face-to-face conferences, intimate breakfast, lunch or dinner events or large conferences with thousands of attendees. Regardless of the number of attendees, there are some fundamentals you need to consider in order to make them as effective as possible and to be in a position to measure return on investment (ROI). The best place to start is to look at your existing customer portfolio and develop an Ideal Client Profile (ICP). Once you develop your ICP, you can begin to tailor events to support the needs of prospects on their buying journey. In the middle of 2013 we discovered a gap in the Sydney market for marketers wanting to learn more about Marketing Automation. Using the Meetup.com platform, we created the Sydney based Marketing Automation Strategy & Best Practice group. We meet on the first Thursday of each month in a hotel in the Sydney CBD (downtown). Our goal is simple, to provide an avenue for marketers to network and engage with like-minded people. We average 25-30 people each month. The event is free to attendees and we provide canapés and drinks on arrival. We generally use a pub/bar for the event and have moved venues a few times typically based on availability. Continuity at one location would be ideal. We have a number of business partners in our eco-system who compliment what we do and what would be of interest to our Meetup members. This includes Oracle, a Sydney based Social Media Consulting firm – Obviam, a Sydney based Market Research firm – Catalyst Research and others. We provide these business partners with marketing assets/branding for the event to help them engage their prospects and customers. We typically share the costs for the event with these partners. We’ve seen positive lead generation outcomes from these events for all parties. Last year I published a blog post providing a format for event management using Oracle Eloqua Marketing Cloud. Click Here to read that post.